the use of harpsichord continuo. Listen to the second movement from Bach’s Brandenburg Concerto No. 4. Notice the solo group of violin and two flutes and the ripieno (accompanying) strings. An orchestra is a large instrumental ensemble with sections of strings, brass, woodwind and sometimes percussion. It is usually directed by a conductor. A Baroque orchestra was sometimes directed from the harpsichord. The continuo (or basso continuo) part was usually played the harpsichord or organ (filling in the harmonies and holding the ensemble together) plus a bassline often played by the cello or bassoon. The harpsichord is a keyboard instrument where the strings are plucked rather than hammered. Orchestral pieces commonly found during the Baroque period include concertos and suites. A concerto is a large-scale composition for an orchestra plus a soloist or a group of soloists. Read this revision bite to learn more about the concerto. Baroque composers who wrote concertos include Vivaldi (who wrote over 500, around half of them for violin), Bach and Handel. There were two types of Baroque concerto - the concerto grosso and the solo concerto. 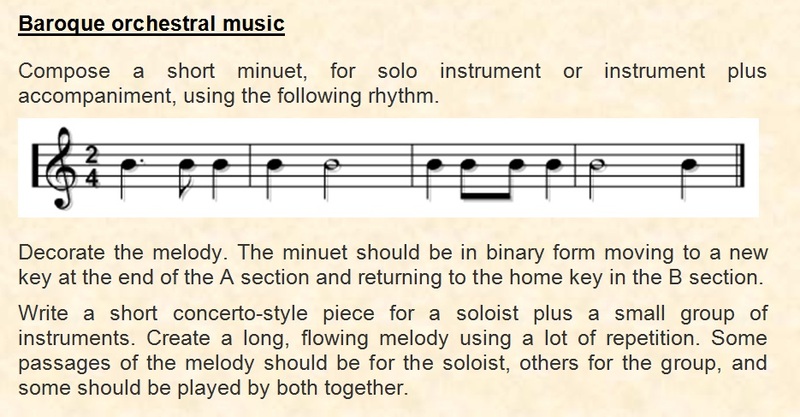 Concertos of both types generally have three movements – fast, slow, fast. Bach’s six Brandenburg Concertos are well-known examples of the Baroque concerto grosso. Most of the dances were in binary form. Binary form has two sections (A and B). The music moves to a new key at the end of the A section and returns to the home key (the tonic) in the B section. Listen to the gigue from Bach's Orchestral Suite No. 3. Notice the 6/8 time signature and the scoring which includes oboes, trumpets and basso continuo.